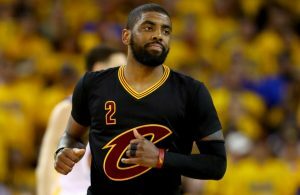 With their recent 94-71 dismantling of the Chicago Bulls in Game 6, the Cleveland Cavaliers advanced to the Eastern Conference finals after a physical, action-packed series with their Central Division rivals. 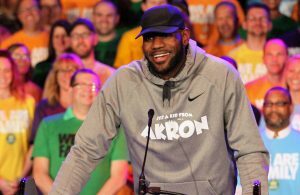 The Cavs, who possess an 8-2 overall record in the playoffs, are only eight wins away from their ultimate goal: an NBA Championship, the city of Cleveland’s first professional sports championship title since that of the 1964 Cleveland Browns. The Cavs are making their first Eastern Conference Finals appearance since the 2008-09 NBA Playoffs against the Orlando Magic, in which Cleveland lost in six games. Standing in their way of an Eastern Conference title is the Atlanta Hawks, the Southeast Division champions and the East’s number one seed. The Hawks, who faced an early 2-1 series deficit in the Eastern Conference semifinals against Paul Pierce and the Washington Wizards, rallied to win three straight games en route to a thrilling 94-91 series-clinching victory in Game 6 at the Verizon Center. Pierce was an absolute nuisance for the Hawks to contain in clutch situations and the closing minutes of games. However, Pierce’s game-tying three pointer in Game 6 was nullified after replay showed he did not release the shot in time. 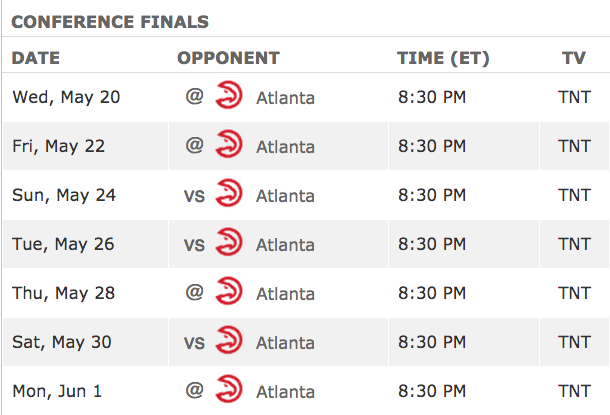 Here’s the complete Eastern Conference finals schedule, with Games 5-7 being played if necessary. 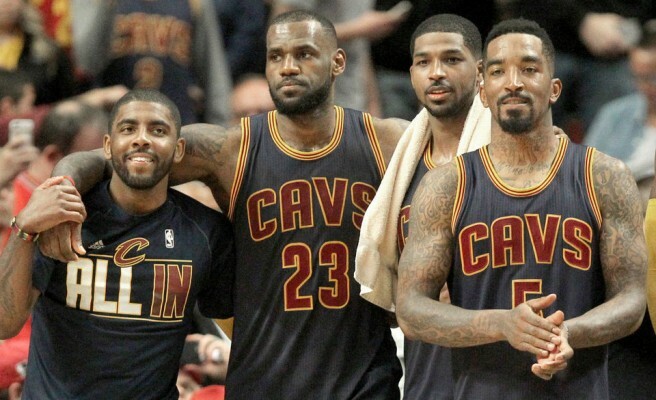 The Cavs, who won the Central Division title this year, will not have home court advantage for the first time in these playoffs. In what should be a great matchup between the East’s top two teams, here are five keys for the upcoming series between the Cavs and Hawks. After a devastating left shoulder injury to Kevin Love during Game 4 of the first round against the Boston Celtics, all eyes were turned toward the play of Tristan Thompson during the Eastern Conference semifinals. Thompson rose to the occasion, to say the very least. 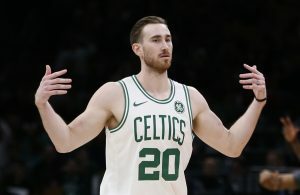 The power forward was an absolute monster and workhorse against the Bulls in Love’s absence, as Thompson averaged 9.3 points, 11.2 rebounds and 1.5 blocks in 37 minutes of action during the series. 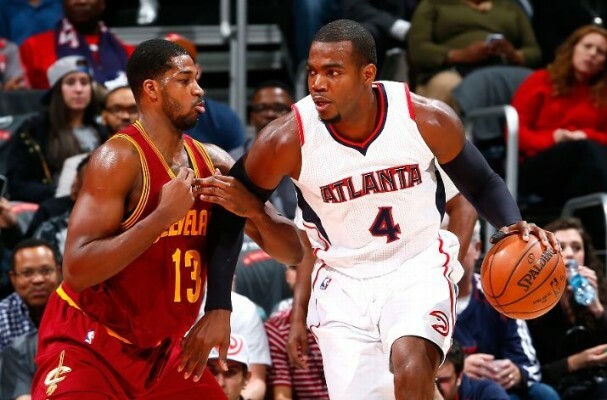 However, Thompson and center Timofey Mozgov will have to play even better basketball against the impressive stat lines of Hawks power forward Paul Millsap (15.7 points, 9.0 rebounds, 3.8 assists and 1.8 steals per game during the postseason) and center Al Horford (15.6 points, 9.9 rebounds, 4.1 assists and 1.8 blocks per game during the postseason) in order for the Cavs to have control in the paint.